Like the river that our agency is named after, our agency is a dependable resource for our community, and we pride ourselves on employing compassionate, caring and dependable caregivers who meet that same standard. All North River caregivers, personal care assistants, and home health aides must be excellent communicators, have a passion for serving and caring for others, and have reliable transportation. Most importantly, our caregivers are focused on providing exceptional care. All applicants for our home health care jobs must pass thorough criminal and motor vehicle background checks as well as extensive reference checks and a drug screening as well as pass a competency test before being hired. 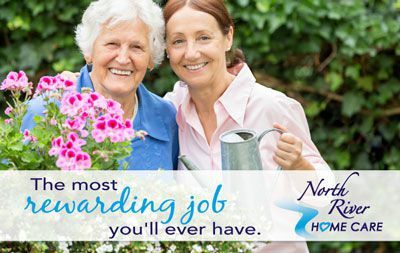 North River Home Care requires at least two years of experience for the caregivers we hire. Ready to start your career as a North River Home Care personal care assistant? If you meet our qualifications, our hiring manager will be in touch with you to discuss the next steps of our hiring process.